If I was in town this weekend, I’d probably check out the west coast sensation Kneebody (at the Dakota 5/1) and Siamese Fighting Fish (at the AQ, 5/1-5/2)... and I would be sorely tempted to stay up to catch Impulso at the Dakota’s late night gig (5/1 at 11:30 pm) and again Saturday for the Ryan Berg ensemble with Brandon Wozniak, Bryan Nichols and JT Bates. 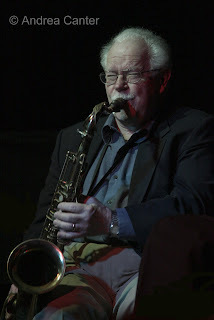 Wozniak is the common denominator of these two edgy improvisational groups, and lately his tenor sax has been heard all over the area map. Kneebody is a youngish quintet described as melding post-rock, classical, and avant-garde forms, and their latest release is a set of Charles Ives’ compositions with avant vocalist Theo Bleckmann. Sounds like an intriguing combination. Siamese Fighting Fish is a trio destined for free-wheeling excitement, with Dean Granros, Anthony Cox and Dave King. That’s a lot of star power and creative collaboration for one band. But the fact is I will be in Chicago checking out the new Jazz Showcase May 1-2, and in particular the Benny Green Trio. 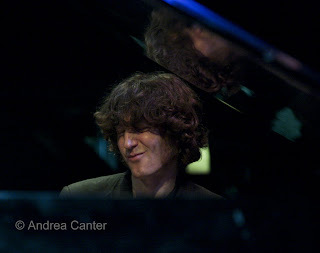 Benny is the heir apparent to the late Oscar Peterson, and in fact Peterson named Green the first recipient of Canada’s Glenn Gould Protégé Award. Green has more than lived up to the expectations that followed him thereafter. I’ll be sure to be back in town in time for the Brad Mehldau Trio at the Dakota (5/3), their first visit since the Dakota relocated to Minneapolis. Sometimes the cerebral pianist takes too many pages from the 1980s Keith Jarrett Book of Ruminations but most often, especially with his trio mates Larry Grenadier and Jeff Ballard, the intricacies serve rather than derail the beauty of the music, whether they are rebuilding great standards or taking off on original material. They will swing most of the time, not with the same exuberance of Benny Green, but with a more restrained, Evanescent ecstasy. Monday night (5/4) I’ll toast Charmin Michelle’s birthday at Fireside Pizza in Richfield, then brave the new challenges of I-35 and head to the Dakota for a rare appearance in that venue by Maud Hixson with the Wolverines Trio. Maud brings the intimacy of cabaret and the tonality and swing of jazz’s finest storytellers to the stage, making her somewhat of an oddity among vocalists---someone who focuses your attention to lyric without letting go of the clarity of melody. Or the riches of some of the unexplored regions of the Great American Songbook. 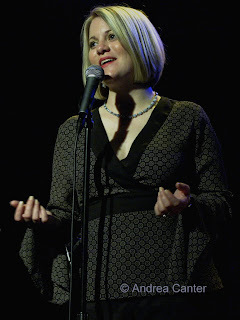 She’s also promised some tunes from her December cabaret show in Manhattan, the songs of Mickey Leonard. Thursday night, I’ll hit the early set at the AQ and check on the progress of The Alternates, a quintet of mostly graduating seniors who came together as (mostly) the “alternates” for the Dakota Combo, the area’s elite high school septet. This will be their fourth AQ gig and each time out, they are tighter collaborators and more confident improvisers. Witness exponential growth by observing teen musicians over the course of a year! And of course I will stick around for the prime time act, the inimitable Dave Karr and his quartet. Coming up? One of the most eagerly anticipated jazz events of the year as far as I’m concerned when Jason Moran and his “Big Band Wagon” octet perform his Monk at Town Hall, a celebration of the 50th anniversary of Monk’s large ensemble performance. At Walker on May 9th. Photos: Benny Green (in Chicago at the Jazz Showcase this weekend); Maud Hixson (at the Dakota on Monday, May 4th); Dave Karr (at the AQ with his Quartet on 5/7). Photos by Andrea Canter.